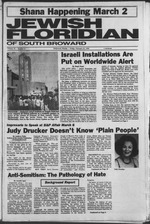 Shcharanaky, turn to the Soviet Jewry Update on Page 11.
rorist leaders were believed to have been aboard. rorists would launch new strikes at Israeli targets. civilians to stay off Israeli and American airliners. it far from Libyan airspace. consulted and all approved the interception. would ultimately be captured and punished. terrorists had any been captured? residents at Hallmark should be proud of its 1986 campaign. the hard work and dedication of the residents at Hallmark. she is a true friend of Israel." is reflected also in our content. nized design, saying that the newspaper needed a different look. Rothschild also thanked the PR Committee for its efforts. Arnie Feiner. Harold Goldberg. Marion Heller, Merle W. Lundy. Elaine Pittell, Alfred Golden, and Beverly Shapiro. on a single day than ever before. a two meals a day plan to let you pack in more excitcntcnt than ever. 24 hours makes a day .. .
7 days makes a week . 30 days makes a month . at the Sheraton Bal Harbour Hotel. Ramat-Gan in Israel, will be the guest speaker. "One dollar a day does make a difference,"
in South Broward and in Israel. tuous luncheon costs just $24 per person. please contact Judy Nemeth at 921-8810.
preparing for their annual UJA/Federation Breakfast on Feb.
23 at 10 a.m. in the Social Hall. others talked in terms of U.S.
Jewish senator who escorted Sen.
the Jewish people and their State. the "public squares of America,"
pressions of support for Israel. The Rev. Dr. Charles V.
Country Club is located at 46. Sidney Jacobs, Mae Weiner and Ethel Sanders. ner, with former Ambassador Jeane J.
Kirkpatrick, Diplomat Hotel, 7 p.m.
Feb. 23 Golden Surf breakfast, 10 a.m.
Feb. 23 Olympus breakfast, 10 a.m.
Feb. 23 Golden View breakfast, 11 a.m.
Feb. 23 Oceanview brunch, 11 a.m.
Feb. 25 Parker Towers, 8 p.m.
St. John's Lutheran Church, 7:30 p.m.
Sheraton Bal Harbor, 1 p.m.
Mar. 9 Golden Horn breakfast, 10 a.m.
Mar. 9 Hemispheres breakfast, 10 a.m.
Mar. 9 Sea Aire Towers, 8 p.m.
Emerald Hills Country Club, 5:15 p.m.
Mar. 16-27 South American Mission. tion, Hillcrest Country Club, 9 a.m.
its American supporters in Congress and the Administration. the Middle East. Evans, who is regarded as the foreign policy "expert"
to here in Washington as "Errors and NoFacts". also continue to destroy their credibility as journalists. man has made the difference, and friends of Israel are deeply grateful. Publlehed Weeldy January through March Bi Weekly April through AuguM. Member JTA, Sevan Aria, WNS, NEA, AJPA. and FPA. neighbors. "But with Egypt. .
dinavia, and the United Kingdom. was decimated by the war). peculiar circular logic of its own. automatic on behalf of a teacher. editor of the Edmonton Journal. an incitement of bigotry and hate. study of the sociology of hatred. he can draw his own conclusions. the Criminal Code of Canada." public battle against the danger." MKs to support the amendment. pressing the "Who Is A Jew"
branches of Judaism in the U.S.
Jewish life in Israel and abroad. thodox members of the Knesset." ed for at least six months. rabbis would constitute a quorum. there are no ideal solutions,"
Conservative rabbis from the U.S.
whom he did not name. land, sea or in the air. Selma Kaye; Ruth Rudo and Michael Schlanger..
are going well in the buildings. tivities, it was disclosed here recently. agency policy, declined to comment on the reports. Lebed's listed telphone number went unanswered. tified by name, but only as "Subjects A-E."
ly murderous security force," the Voice said. vided by Yad Vashem in Israel. that can develop into a fire." was to "kill a few rich Jews." groups" in West Germany today. and deeply regret them," he said. "Basket of Love" Luncheon. More than 100people attended. both hearing and deaf performers. "All you need is a special spirit. depend on helping one another. ing his arms into the air. former with a sense of pride. Set aside 1 cup Hour In large bowl, ma remaining Hour, sugar, sat. and the other about ^ot dough Divide larger piece into 3 equal pieces. Rosenkopf, chairman; Bea West, Sid West and Joe Kleiman. "The Library of Yiddish Classics"
serves as its president, with Dr.
author and his or her times. .For Reservations Phone: waldman 1 -538-5731 or 534-4751.
unknown, many of them women"
at the recent Host and Hostess Committee meeting. munity Pacesetters Dinner Dance on Feb. 22. ROUND LAKE CAMP, Lake Como, Pa.
18900 NE 25 Ave., North Miami Beach. was carrying top terrorist leaders. for the Israel Air Force. issued a statement to that effect. have been watching the aircraft. One coupon per two Items purchased. sing for the soldiers at the hotels. and raise their three children. ly, it can be very damaging,"
had heard was very talented. back into the world of real music,"
rather than as an impresaria." she did is a trade secret. performers that marks her work. do I have a chance to sit and yak?" me. He makes wonderful pasta,"
Miami Beach, both in 1982.
le oil and gas industry. ranks of Soviet Jewish refuseniks. to stay and liberalize the society. aimed at the Soviet masses. over the world for 2,000 years. and say: 'Next year in Jerusalem. ed on the U.S.-Soviet agenda. plight of Jews in the Soviet Union. brief period, under heavy guard. strike that would last 109 days. mail sent to his wife, A vital. VLADIMIR concerning his wishes regarding a defense lawyer. am afraid that in a short time it will be too late." to try him on trumped-up charges. ty treats of our complete buffet. day to register at 921-6611.
will start at 2 p.m.
tion for Seniors 12:30-2:30 p.m.
for Senior Citizens at NO COST. call Liz or Karen 921-6518.
tion call Liz or Karen at 921-6518.
us once a month for one hour. Carrie Gordon or Joe Gordon. PubHx BakertM open at 8:00 A.M.
Pecan Danish Ring.......ess*. $ 1"
tion would have been determined. cepted some form of autonomy"
ition. Ask for Liz or Pauline. I Alive Defensive Driving Course. March 5, 12 noon-4 p.m.
March 19, 26 noon-4 p.m.
April 9, 16 noon-4 p.m.
Center, 2930 Hollywood Blvd., from 11 a.m.
e of tobacco, may all be factors. Park on Sunday, Feb. 23.
will be provided by Free Hebrew. between the ages of 6-13.
morning, Feb. 22, at 8:45 a.m.
Daily minyan are at 8 a.m.
p.m. Donation is $25 per couple. tion call Ellin Heihg at 431-5100. On Friday, Feb. 28, at 8 p.m.
of its North American operation. p.m. The public is invited. 1361 S. 14th Ave., in Hollywood. to gather material for an article. ed at the door for $2 each. Staci Kushner, daughter of Mr.
March 6 at 8 p.m.
March 9, at 9:30 a.m.
8 p.m. Tuesday, March 11.
on school days, 9 a.m. to 3 p.m.
grand opening will be held. through Friday, 10 am. to 5 p.m.
please call Ron Cahn, 966-2200. TITmI lE*'wm*r 3291 8tWh* *** 9M"78^. *** Mwd Davis. Kapoek. Service, dady 8 a.m.; Sabbath 8 p.m.; Sabbath morninr 8:46 a.m *UrM. Sen** Nuraary. Bar Mttmh, Judaica High School ^^ a.m. Rangta. Tiaipli Hliinf-1201 **nson St. Hollywood: 920-1677. Rabbi RknardJ Marrolia. Taapat Seiel 6100 Sheridan 8t. Hollywood: 9S94206 Rabbi Robert P im. riday evening, Feb. 21, at 8 p.m.
Jacobs in honor of his birthday. tinues with Rabbi Richard J. [he luncheon begins at 11:30 a.m.
id is by reservation only. Mr.
^gin at 8:15 p.m., Friday, Feb.
[urgical portion of the service. Ifir son David Brian Mishkin. become a Bar or Bat Mitzvah. bin School of Living Judaism. South, 3801 South Ocean Drive. Affect Us." Bring your friends. stature in the Jewish community. marriage, travels to see the world. Federal Savings and Loan Bldg..
voluntary groups in forty nations. years old and lived in Manhattan. ly returned to the U.S. for burial. company for a television docu-drama. ing up to become assistant personnel director. at any time, at any place."